What is TAHITIAN NONITM Juice? 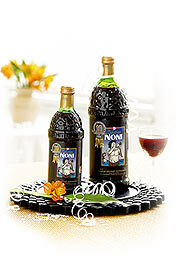 TAHITIAN NONITM Juice (The original noni juice) is the original product of Tahitian Noni International Company, made from the pulp of the noni fruit (Morinda Citrifolia). This drink is a fruit juice made up of pure juice from the noni puree (89%), the rest of 11% consists of grape juice and blueberry juice concentrates. Pasteurised. Recent research has confirmed that TAHITIAN NONITM Juice has a beneficial effect on the immune system and contains strong antioxidants which help the body to fight efficiently against the free radicals. This noni drink also provides energy. 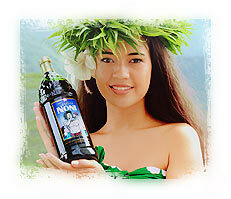 By accessing our web site, you will find useful information regarding TAHITIAN NONITM Juice, the original noni juice. We strongly recommend you this product as it is so beneficial to the health. For its special properties the noni plant has been used for more than 2000 years in Polinesia, India, China. For order the original TAHITIAN NONITM Juice, please access the « Order » section of our web site.